John Lennon "Borrowed Time" The Solo Years limited edition silkscreen print, published 1995. "Borrowed Time" appeared on Lennon's last album, "Milk and Honey" with Yoko Ono. This print os number 277 from a limited edition size of 1000 with 75 artist's proofs and 6 printer's proofs. The printing was completed by hand through Atelier, GF Toronto, Canada on Woolfitt's Watercolour paper. Published exclusively for Bag One Arts, Inc. 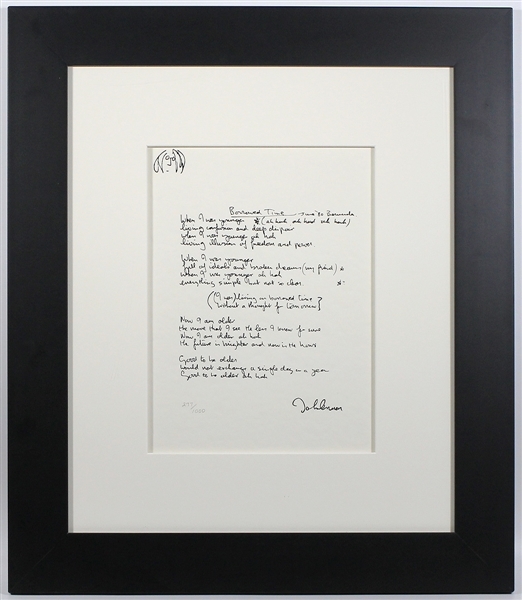 This limited edition lithograph is part of a portfolio that has been approved and endorsed by the Estate of John Lennon and personally selected and authorized by Yoko Ono Lennon. Matted and framed to measure 19 x 22. The print is accompanied by a certificate of authenticity from Celebrities, Gallery of Celebrity Fine Art, in Lahaina, Hawaii and a Gotta Have Rock & Roll™ Certificate of Authenticity.